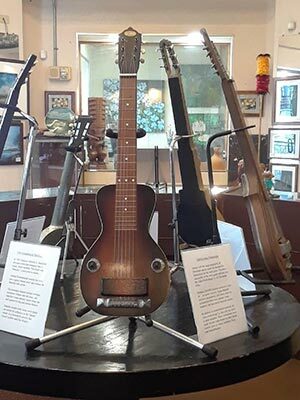 A STEEL GUITAR EXHIBIT featuring vintage lap steel guitars will be presented at the Story of Hawaii Museum located at the Outlets of Maui. Some steel guitars date back to the 1930s. A HANDS-ON STEEL GUITAR EXPERIENCE will provide festival guests with opportunities to become better acquainted with the Hawaiian steel guitar. FRIDAY SCHOOL PRESENTATIONS The festival's educational component provides learning opportunities for local area schools. These educational presentations will be made by teams of festival steel guitar masters and are geared towards reintroducing the Hawaiian steel guitar to the younger generation and to get them interested in the instrument and its importance in Hawaiian music. FRIDAY AND SATURDAY OPEN STAGE SESSIONS will present various Hawaiian steel guitarists or groups with a Hawaiian Steel Guitar. 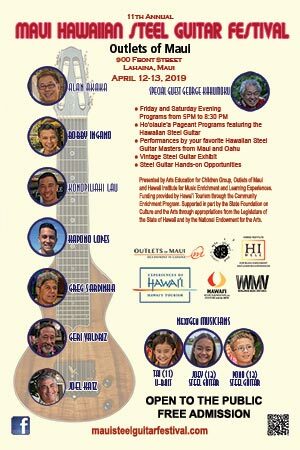 FRIDAY AND SATURDAY EVENING HO'OLAULE'A programs will showcase the Festival's featured master steel guitarists in individual programs. FRIDAY AND SATURDAY EVENING KANIKAPILA jam sessions will be held at the Pi Artisan Pizzeria. Festival guests are invited to bring their instruments, amplifiers, and music stands as appropriate and play along Hawaiian-style with the steel guitar masters. SATURDAY WORKSHOPS covering various steel guitar topics will be offered at the Story of Hawaii museum located at the Outlets of Maui. NextGen Steel Guitar students and musicians of Ke Kula Mele Hawaii School of Hawaiian Music will perform for festival attendees' enjoyment. These musicians as young as age 11 will play during the Open Stage Entertainment and in the main ho'olaule'a programs. Steel guitar workshops will be presented by Alan Akaka and Bobby Ingano. Friday and Saturday Open stage entertainment will feature guest artists and performers. These performances will showcase a variety of steel guitarists. 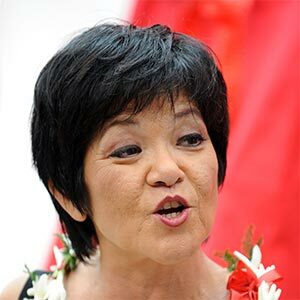 This year's festival will feature Ho'olaule'a programs on Friday and Saturday, each hosted by Maui actress, comedienne, storyteller and radio personality Kathy Collins. The Festival moves to the Queen Ka'ahamanu Center in Kahului from 11 A.M. to 3:00 P.M. on Sunday. 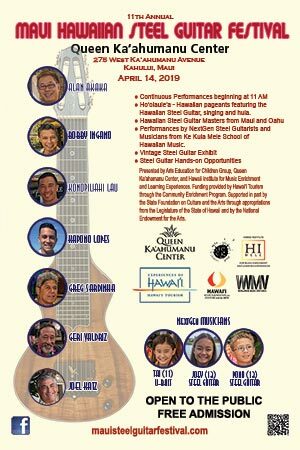 Maui County mayor Mike Victorino is expected to present a Mayoral proclamation on Sunday, April 14, declaring the week of April 8-14, 2019, as Maui Steel Guitar Festival Appreciation Week. See the Proclamation. The Festival Archives contains program information from previous festivals.